Some of you may be aware that I often imagine things in random shapes that other people have trouble envisioning, sometimes even after I draw them out. On June 3rd my wife and I baked tiny pancakes, and here’s what I saw in two of them. 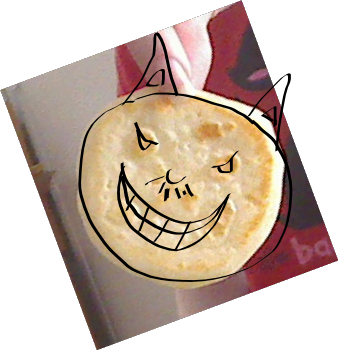 The first pancake that managed to attract my attention was an evil cat. This pancake also happened to be on the plate while taking a picture of the evil cat one, so I figured I’d demonstrate that I do indeed see something in just about anything. Note, these are animated SVG images. At the time of writing they only render correctly in Opera and Webkit browsers, whereas Gecko displays a static image. Internet Explorer is served with fallback PNGs. The SVGs now also render correctly in Firefox 4. Replaced OBJECT elements with PICTURE elements.